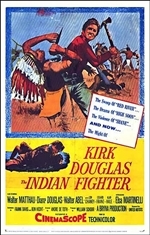 The Indian Fighter is a 1956 American Western film directed by Andre De Toth and based upon an original story by Robert L. Richards. Johnny Hawks is a man who made his name fighting Indians. Returning to the West after the Civil War he must now keep wronged Sioux warriors from massacring the Oregon-bound wagon train he is leading and the nearby fort.